There are several other options that can be specified from the Options panel. Open the Option panel and then click on the Options button. This panel is used to specify the Homeseer connection information. 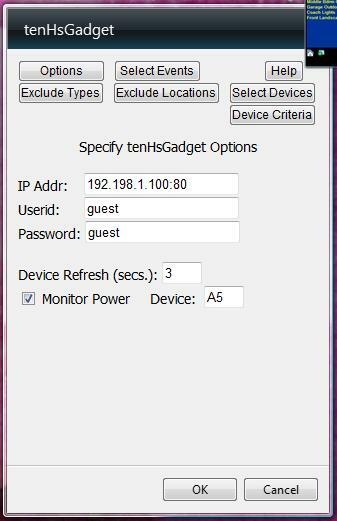 In order to accurately display the status of the Devices in the Device List, tenHsGadget must query Homeseer frequently for the Device Information for each of the selected Devices. The default is to perform the query every 3 seconds, but you can change this to a higher value from this panel. tenHsGadget can determine when your computer display is powered down by Vista power settings, and can turn OFF a specified Device, and turn it back ON when the computer display is powered back on. This can be used to turn OFF the lights in the computer room when the computer is not in use. This capability is enabled and the Homeseer Device Code to use is specified from this panel. Click on the Help button to open the Help panel. 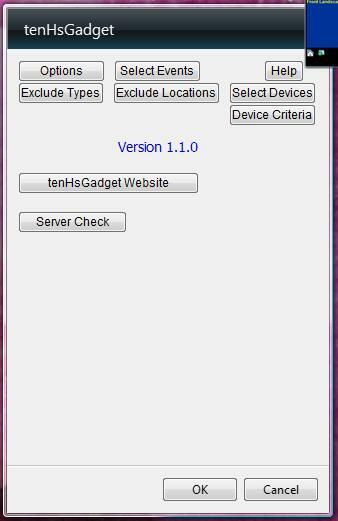 The tenHsGadget Website button will open a browser window to the tenHsGadget website.